A flooded basement can be catastrophic and even dangerous. Learn why below. April showers may bring May flowers, but for some homeowners, they can also bring a world of worry. Few problems are quite as frustrating as a flooded basement, and if your sump pump isn’t up to the task this spring, you may find yourself having to deal with this problem. Standing water on the floor of your basement is not only a big inconvenience, it can also cost you a significant chunk of money to fix and clean up. Moreover, a flooded basement can actually be a danger to you and your family. Here’s why. Mold flourishes in a wet environment, which makes a flooded basement the ideal place for it to grow. Mold is very dangerous and can cause health problems like eye irritations, respiratory problems, and skin rashes. Over a long period of time, these can further progress into more serious problems like memory problems and brain damage. Luckily, the best way to prevent mold from growing in your flooded basement is to have the problem treated right away. Water damage isn’t as much of a risk to your health as mold is, but it’s a huge mess that no homeowner wants to deal with. If you have a finished basement or are even just using it for storage, a flood can damage your belongings and cost a lot of money in restoration work. Your foundation can also suffer damage from a flooded basement. Cleaning up the water and carpet is usually not sufficient – water damage tends to penetrate through walls and under floors as well. 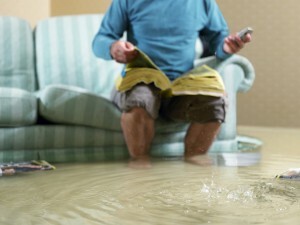 The best way to treat a basement damaged by water is to call in a damage restoration company. If you fear that your basement is at risk of flooding this spring, contact a professional plumbing company like Master Plumbing to assess your situation. We can take a look at your sump pump and plumbing to see if you need any additional capacity. Don’t live in fear of a flooded basement this spring! This entry was posted on Thursday, April 6th, 2017 at 7:17 pm. Both comments and pings are currently closed.